Our restaurant grade process will make your oven sparkle. 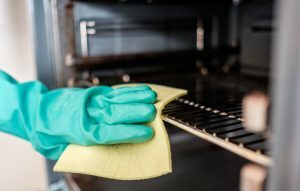 This is a difficult job that most people would prefer not to do, so let us take care of it for you with our professional oven cleaning service. Our team of two will arrive with all the equipment they need to do a thorough job. We employ a commercial-grade system with organic cleaning products. Most people book this service around four times a year. This is one of our most popular services, and we have gift vouchers available. This service can be booked online. Go to our spring clean checklist and you will see oven cleaning listed. We offer our professional oven cleaning as a service across all our regions: Palmerston North, Feilding, Wellington, Kapiti Coast, Hutt Valley, and Christchurch. Special professional oven cleaning offer! Have your oven cleaned by us three times, and the fourth time it’s free!